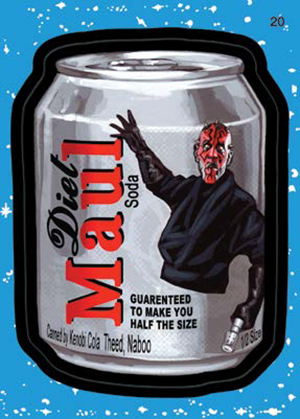 The Star Wars Universe is no stranger to parodies. Whether it's something high-profile like Spaceballs or some strange costumes at your local comic con, the options are endless. 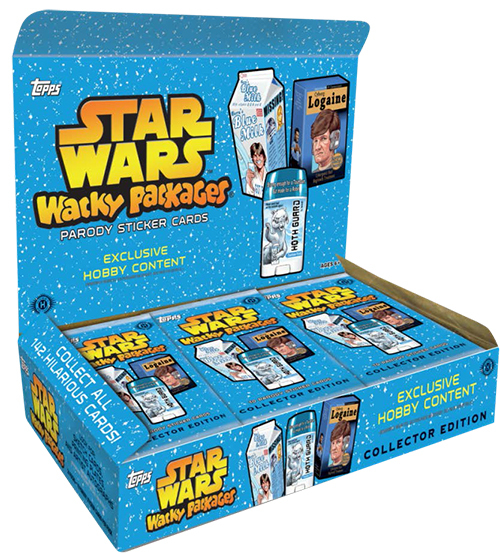 Now trading card collectors get their turn with 2014 Topps Star Wars Wacky Packages. The set mashes up two of the most popular and longest running entertainment card properties of all-time. 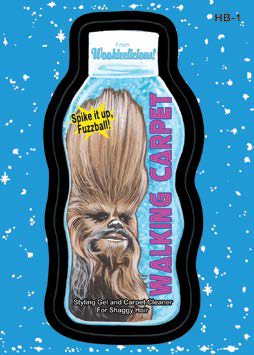 It sticks with the Wacky Packages theme of poking fun at foods and other products you'd expect to find at a grocery store. But there's a twist. 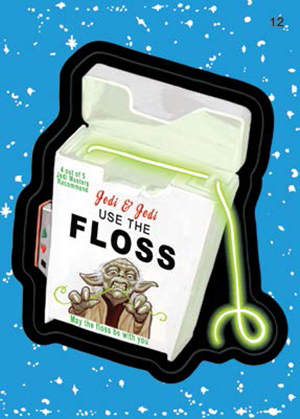 It's poking fun at products you might find in the world of Star Wars. There's some familiarity from both worlds. 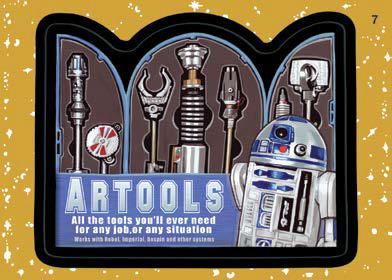 The 2014 Topps Star Wars Wacky Packages base set has 100 cards. This includes 50 different card fronts, each with two different backs. Flip sides include a mix of puzzles, ads, coupons and checklists. Parallels include Blue (one per pack), Gold (1:8 packs), Printing Plates and Gold Star Field (#/10). 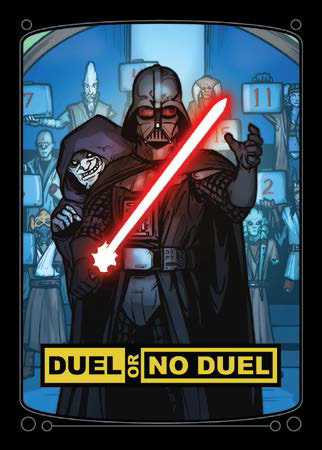 Reality TV (ten cards, 1:2 packs) puts a Star Wars spin on ten shows we're familiar with. 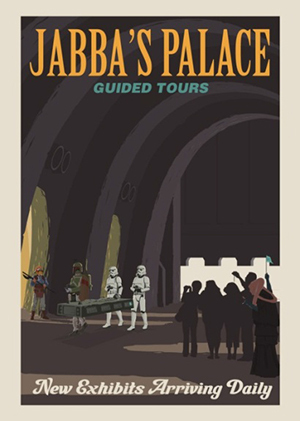 For Star Tours fans, there are ten Travel Posters (1:4 packs) that tackle top tourist destinations in the Star Wars Universe. 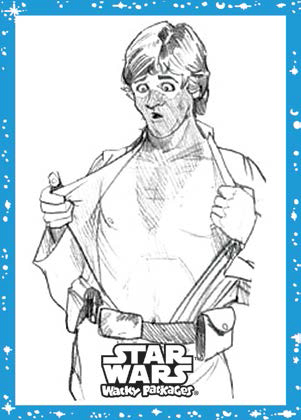 Coloring Cards (1:6 packs) offer line art from ten base cards that collectors can color as they see fit. 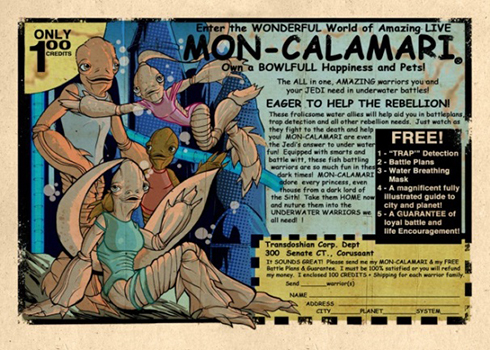 Fold-Out Comic Book Ads (1:12 packs) take a retro-styled approach to create over-sized inserts. Four Bonus Stickers can be found exclusively in hobby boxes. 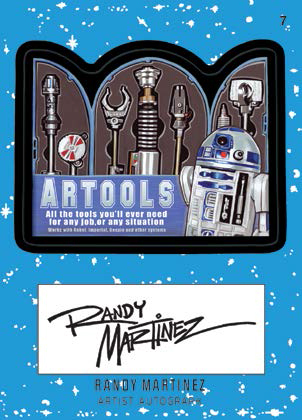 As far as hits go, collectors can find randomly inserted sketch cards and Artist Autographs. Unlike past sets that have used stickers, autographs are signed on-card. Estimated Release Date: TBA - the set has been cancelled, although it is possible it could resurface. 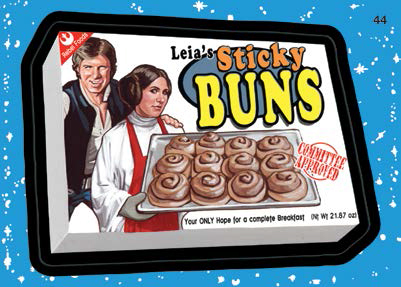 I remember collecting these as a kid.making a Star Wars theme batch just fits the bill. 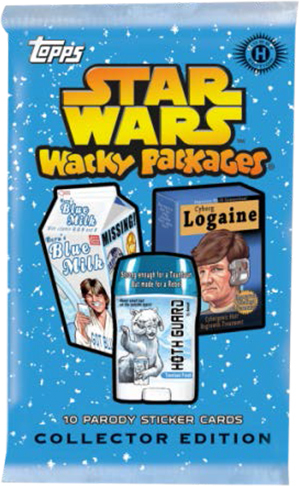 I’m not a fan of Star Wars but wow, this is going to be so much fun to start collect this new series related to Wacky Packages! I’m going to check it out! 2015 Topps Sports Wacky Packages Trading Cards ? 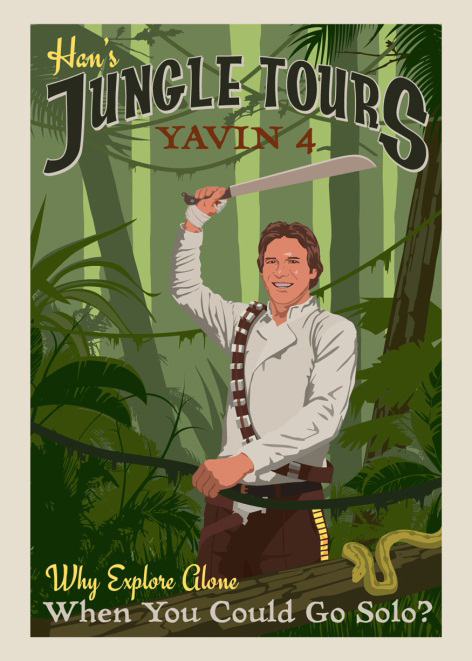 Is it true that this was cancelled by Topps? Dan � I’ve heard the same rumors and reached out to Topps last week but haven’t heard back from them yet. As curious as I am — which isn’t super-huge — I was surprised to see this advertised in the Previews a couple of months back. It just feels like the same sense of humour that got Seth Green’s new show placed into “the can”. 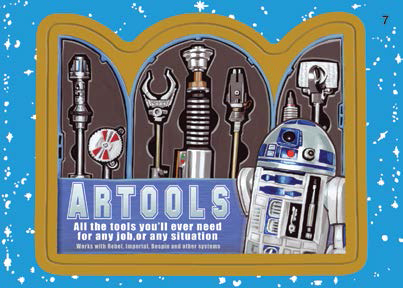 However, the LEGO animation/games seem alive and well, and they’re heavily based on silliness and puns as well. Impossible to find… Have these been released? Damien F � I never heard back, although it’s not coming out as planned as it has been removed. Whether it has been cancelled entirely or the plan is to repackage it in a different form, I’m not sure.